Here’s the Top 3 Most Popular Cookers by demand in 2014, compiled by Boyhill Cookers. Some of the models are only for cooking, with optional back boilers for hot water, and others come ready for hot water and/or central heating. They are all great cookers without a doubt, and we stock and supply reconditioned and new models. We can refurbish/recondition your own cooker also, so check with us before you buy new. Top of the list this year is the Reconditioned AGA Cooker. This is a time tested favourite, available in a range of colours and fuels. There are 2 variations, with 2 ovens or 4 ovens, and the 2 oven version is the most popular. Also the fuel types are oil, gas (LPG and natural), and solid fuel. The oil fired version is the most popular right now. 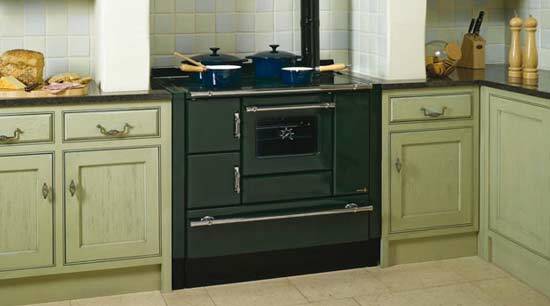 The AGA is a design classic symbolising quality and craftsmanship and is made in England. It is are highly durable and constructed from the best quality cast iron. 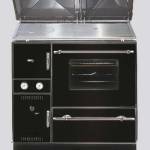 It is versatile and flexible and available in a number of fuel types and sizes, with between two to five ovens and in a large range of colors. Whatever the size, every Aga cooker has a boiling and simmering plate together with at least one roasting and one simmering oven. Just as an AGA doesn’t look like a conventional cooker, it doesn’t cook like one either. If we take a look inside, we can see how the high quality iron castings make AGA cooking so different and so special. The iron castings create an outstandingly efficient energy store steadily transferring heat from the inner core through to all the inner surfaces of the oven cavity. Once the Aga cooker is up to temperature, only a small amount of energy is required to maintain the required heat in each area it is then released in the form of a gentle radiant heat. Each oven and hot plate is always ready at exactly the right preset heat for the job, for example roasting or baking. 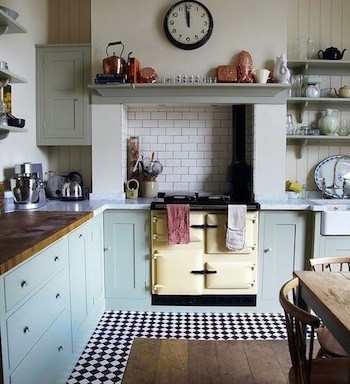 An AGA can always be ready to use whenever you need it with the radiant heat providing even all over cooking. The principal is similar to sunshine on a hot day, warming the environment around us and everything in it. In cooking the absorption at the radiant heat seals the surface of your food looking in the flavors moisture and goodness, ensuring AGA cooked food tastes delicious and retains its nutrients. In addition to traditional are AGA cookers, there is now the AGA “total control”. Total control cooks in exactly the same way by using radiant heat from the cast iron, the castings are heated by elements embedded within rather than heat been transferred from a single heat source. This enables the hot plates and ovens to be operated individually as required. On all AGA heat storage cookers the ovens and hotplates give you a huge range control easily adapting to all of your cooking requirements. The top of the oven can be used for grilling, and is great for browning dishes the middle is ideal for roasting and baking pastry and bread, and pizza can even be cooked straight on the open floor. At a moderate heat the baking oven as found on most new models is perfect for cakes and biscuits. Succulent casseroles and slow roasts can be left to cook in the simmering oven all day providing fantastic and convenient food. The simmering and boiling plates make it easy to optimize the rate of cooking, simply by adjusting how much of the pans base is on either hot plate. The simmering plate can be used as a griddle, brilliant for toasted sandwiches. And the famous AGA toast, crisp outside and soft inside with its characteristic criss-cross pattern is made on the boiling plate. As both hot plates and ovens are on at the same time, it is easy to get the most from your AGA by initially heating the food on the hot plate and then transferring it to cook in the oven. An AGA can easily cope with entertaining, as up to seven pans can be stacked within the simmering oven for cooking vegetables and rice, or simply keeping food warm. The two hot plates are large and each will accommodate 3 sauce pans. The true benefit of cooking using radiant heat means the food you cook tastes better and it is a healthier way of cooking. Whatever you’re cooking requirements, the AGA provides perfect results every time. 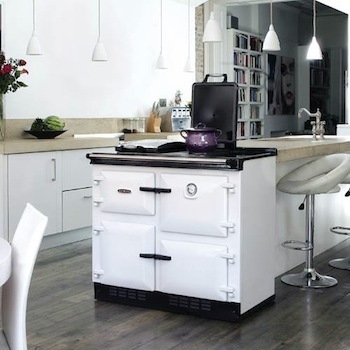 “The story of the AGA cooker is one of award-winning innovation and a proud heritage stretching back to 1922. Today’s AGA is made in exactly the same way as it always has been. Quite simply, molten iron is poured into moulds. It’s this technique that gives the castings their characteristic surface – each one is unique – and sets the AGA apart from the ubiquitous mass-produced uniformity. Second place belongs to the Reconditioned Rayburn cookers. So what’s the connection between an AGA cooker and a Rayburn? Well, for a start, they have a lot in common because they are both made by AGA. 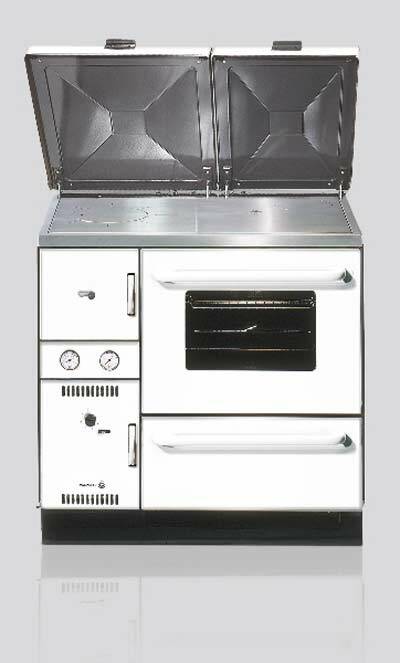 A Rayburn will also provide all the features and benefits of an range cooker in terms of ability to cook and by providing some level of radiant warmth. A major difference is that the Rayburn range gives you the added benefit of being able to provide you with hot water and to heat your home too. With a Rayburn you get everything – cooking, hot water, and heating in one package that is superbly built for performance and top class quality for longevity. The Rayburn Heatrangers have built in boilers that can handle up to 20 radiators around the whole house, upstairs and down, as well as providing for your cooking and hot water. All of that in an “A” rated efficiency construction that will minimize your running costs. For those who are looking for an eco friendly, sustainable system to handle all your household needs for cooking, heating and hot water, the wood fired version is the perfect choice, especially if you are rural and can get your hands on a supply of wood! So AGA range cookers and Heatrangers are of the same quality build, with great looks and superb efficiency, the difference only lying in the ability of the Rayburns to heat your water and your home. 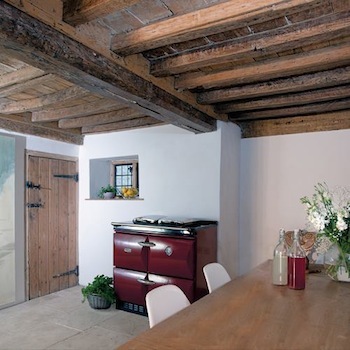 They both have a parallel history, being built to the highest standards of quality at the historic foundry in Coalbrookdale, assuring you of the best cooking experience that will last a lifetime and more. Rayburns were first launched in 1945 and the perfecting of their design has continued since then till today – they are a really iconic piece of craftsmanship that will enhance any home. There is a nice booklet here that outlines the amazing heritage of the Rayburn Heatrangers. 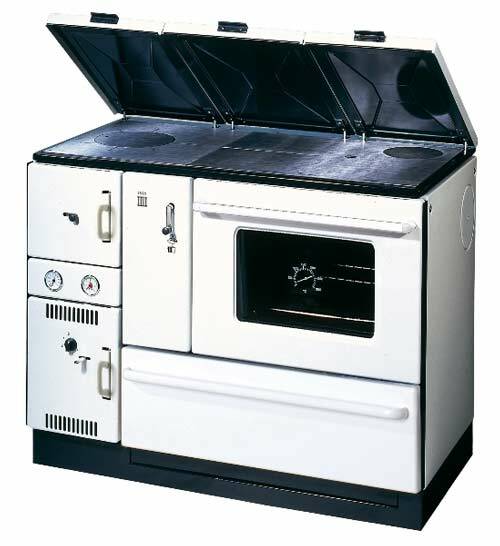 The Rayburn cookers that see the most demand for us are the “Royal” and the “Supreme”. 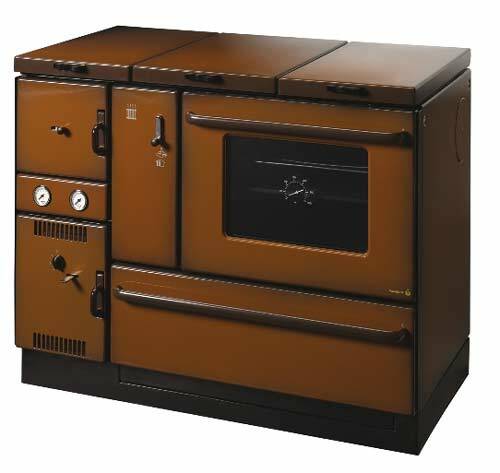 The Royal (200 series) is available in many configurations and boiler options, but sells best in either the oil-fired or solid-fuel versions. The one that we have found is the most popular is the version for cooking and hot water only. The Supreme [or 300 series] will cook, give hot water, and heat up to 10 radiators, and it is the solid fuel model that is most popular now. 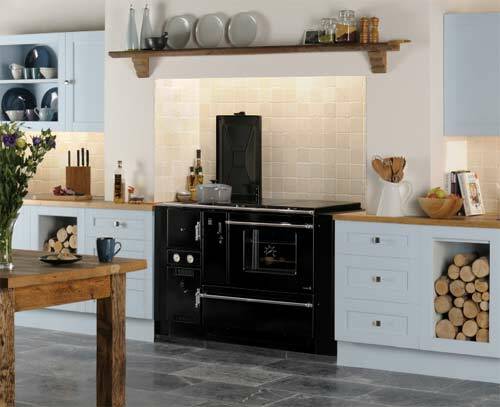 If you’d like any more info and spec about the Rayburn, including specific advice on an install, please get in touch – we will be delighted to help you get set up with these wonderful cookers. Third place is taken by the Wamsler brand solid fuel cookers. German made super quality. 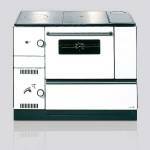 Very few cooker manufacturers offer both right and left hand cookers for sale, but Wamsler do. They come in a range of sizes and capacities, as we describe below, with central heating and hot water production capabilities. They also come in a range of solid fuel “cooking only” options. They are available in a range of enamel colours as well as stainless steel versions. The 900 series and the 1100 series differ in oven size and hot water output. 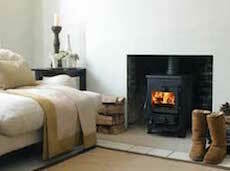 The perfect solution to today’s solid fuel heating and cooking requirements for the homeowner. Well-proportioned design, clean lines and choice of colours, make the 900 series central heating cooker a perfect choice to fit into your kitchen. There is a central control system which allows you to direct the heat to exactly where you want it; for cooking, baking and roasting or to the central heating and domestic hot water supply, making operation super easy and convenient. With a generous 58 litre oven capable of holding a massive load, and the ability to hold a great number of pans across it’s massive heat-retaining hob, you will find that there is considerable cooking capacity. There is sufficient max heat output (16 KW) to run around 10 radiators and have ample domestic hot water too. The difference between the 900 series and the Wamsler 1100 series is that the 1100 series has an oven size of 70 litres and a max heat output of 18 KW, giving you more cooking and heating capacity. The Wamsler burners are very flexible and you can move the firebox up & down so that you can set the boiler size to anywhere between 10.000btu & 64.100btu for the 1100 series and between 10kbtu and 54kbtu for the 900 series. You can regulate the heat so that it will go around the oven or not, and this allows you to send more heat to the hob and to hot water production – very clever and useful for fast heating and efficiency in different times of the year. You can also get some really nice hot plate lids and towel drying rails for your Wamslers. The oven temperature gauge lets you control and monitor the oven temperature for accurate baking, and there is a window for viewing the baking. 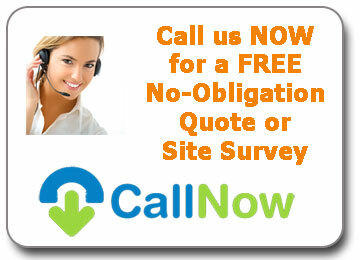 “Having just bought the Range I am still getting used to it for cooking and heating. A great all rounder, this may just have enough power for all your needs. Has Clean-burning and the nominal heat output to room is around 4kW, as well as nominal to hot water of 16kW. There are several variants in colours – blue, black, brown, white, and stainless steel. Most colours can be had with or without lids. This one packs a punch, and is designed to fill all your cooking and heating needs for the average home, with solid fuel. OK, that’s it for the top 3 solid fuel cookers. We hope you found these reviews useful and informative. Remember, we can provide you with any of these top selling cookers, and install them for you. Hiring an installer that may NOT be fully trained and competent to install your cooker is extremely risky. Your solid fuel or wood burning cooker installation costs could get out of control and end up being a lot more than you bargained for! Is it really worth the risk?